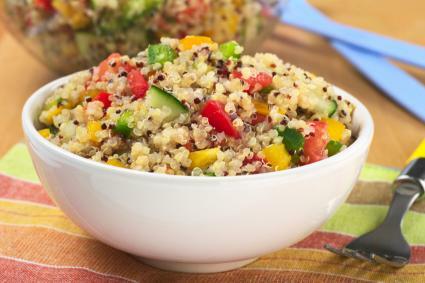 Quinoa is a nutritious and versatile grain. It is easy to work with and makes wonderful vegetarian main courses, salads, and side dishes. You can cook quinoa in many different ways. Use it in soups, salads, and even as a breakfast cereal. Since dried quinoa can be coated with a bitter residue, it's best to rinse it before cooking. This warm and nourishing breakfast cereal is higher in protein than oatmeal or grits. Serve it topped with your favorite berries. Place on medium high heat and cover. Cook until milk has been absorbed, about 8 to 10 minutes. This makes a good lunch, snack, or side dish. You can vary the recipe by adding your own seasonal vegetables. Once water boils, reduce heat to low and simmer until liquid is absorbed, about 20 minutes. Cool quinoa to room temperature. 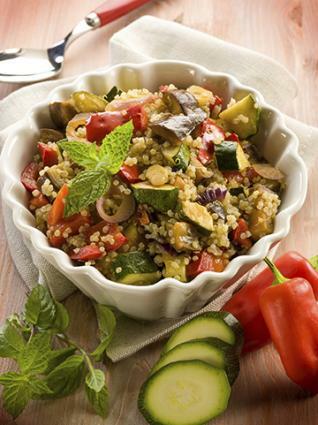 When quinoa is cool, combine it in a medium-sized bowl with radishes, peppers, carrot, zucchini and scallions. In a small bowl, whisk together lemon juice and zest, garlic, and olive oil. Season to taste with salt and pepper. Pour vinaigrette over quinoa and veggies. Add parsley. Toss to combine. 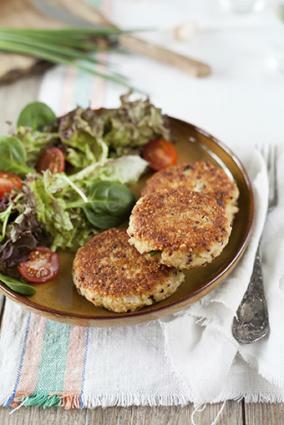 Try these tasty cakes as a main dish, served over a bed of greens. Place quinoa and water in a small saucepan. Bring to a boil over medium high heat. When water boils, reduce heat to medium low and cover. Cook quinoa until liquid absorbs, about 20 minutes. Meanwhile, scoop potato flesh from skin. Place flesh in a medium bowl. Add milk, cheese, and garlic to potatoes and mash. Stir in cooked quinoa, black beans, bread crumbs, pine nuts, thyme, rosemary, salt, and pepper. Form mixture into 2-1/2 inch balls. Flatten into cakes. Place cakes on a parchment-lined baking sheet. Bake for 30 minutes, flipping halfway through cooking, until cakes are golden on both sides. These quinoa balls are seasoned with Greek herbs and spices. They are delicious with tzatziki wrapped in a pita, or can be placed on a bed of arugula, tomatoes, and cucumber with a tzatziki dressing for a main dish salad. Place quinoa and water in a medium saucepan. Bring to a boil over medium-high heat. Reduce heat to medium-low and cover, cooking until quinoa absorbs water, about 20 minutes. Meanwhile, heat olive oil in a small saute pan. Add baby spinach and cook until it wilts, just a minute or two. Remove spinach mixture from heat and put in a large bowl. Add quinoa, marjoram, rosemary, salt, pepper, feta, lemon zest, and bread crumbs. Stir until ingredients are just combined. For mixture into one inch balls. Heat olive oil in a saute pan over medium-high heat until it shimmers. Add balls to oil. Cook, turning balls occasionally, until they are golden brown on all sides, about 10 minutes. 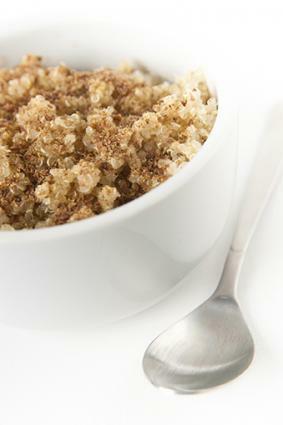 Similar to a rice pudding, this quinoa pudding is a healthy way to end your meal. Place almond milk in a medium saucepan. Scrape seeds from vanilla beans into the almond milk. Stir in syrup and salt. Cook, stirring occasionally, until quinoa softens and mixture thickens, about 30 minutes. Serve topped with fresh grated nutmeg. Quinoa is a versatile ingredient that you can use in both sweet and savory dishes. With so many uses for quinoa, this healthy grain will surely become a mainstay of your vegetarian cooking.